Kake Chips are available everywhere Tastykake is sold for $2.99 per bag. Well, they're not kale chips. They won't be a healthier choice in that sense. 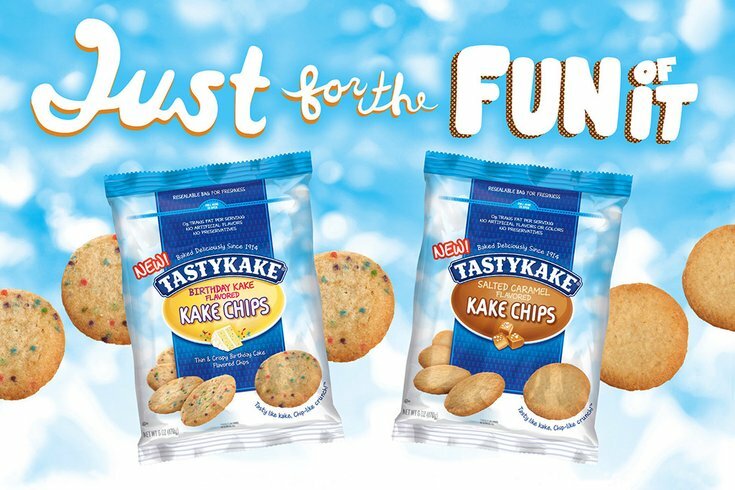 But Tastykake, the Philadelphia-based maker of the beloved Krimpet and many other hits, just debuted a brand new snack: Kake Chips. Yes, you can now consume your Tastykakes in the form of chips, which seems to be a bit less of a caloric investment than the packets you spent your childhood licking clean. These have the potential to be lethally tasty in the same way Sweet and Salty Caramel Bugles can take a controlling interest over your appetite. Kake Chips combine the chip texture and the cake taste, making them a candidate for a Nutella spread. The new chips come in two flavors: birthday cake-flavored crisps with colorful sprinkles and Salted Caramel Kake Chips. As of Sept. 25, they're available on retail shelves around the country.